Despite the stigma now attached to these amphibians, frogs have been an important part of human spirituality long before Jim Henson introduced the world to Kermit the Frog. The Egyptian frog deity, Heket (Heqet), is the fertility goddess who is responsible for breathing life in to newborns, thus allowing them to take their first breath. It is Heket that brought life to the god Horus, one of the oldest Egyptian deities. Native American tribes also hold frogs in high esteem as a symbol of Transformation and Change. The Tsimshian people believe that frogs are the link between Mother Earth and humans, while various other tribes view frogs as signs of the end of winter. According to tradition, when winter's last snowflakes fall, they turn into frogs and inform the tribe that spring is merely a few weeks away. In Asia, a frog symbolizes good luck and safe voyage since the animal is closely associated with the natural element, Water. They are also the liaison between the living and the dead. Small jade frog figurines are usually placed in the mouths of deceased loved ones to ensure a safe journey to the Afterlife (much like the ancient Roman practice of placing coins on the eyes of the dead). In medieval Europe, frogs were closely linked with witchcraft and Paganism. As such, these amphibians were thought to be a sign of the Devil. Remember the famous line Double Double, Toil and Trouble, Fire burn and Caldron bubble from Shakespeare's play MacBeth? The witches were cooking up a poison using frogs. However, in the Celtic tradition, the frog was seen as a healer. An old fairytale recounts the efforts of a young princess trying to find a way to cure her ailing mother. She met Losgann, the frog charged with the duty of guarding a well with healing properties. He gave her a cup of the magical water in exchange for her hand in marriage. She was hesitant to marry him, but eventually did so. Losgann then asked the young princess to cut off his head and when this was done, he morphed into a handsome prince. It is believed that this is the original tale on which the famous fairytale The Frog Prince was loosely based. Frogs also symbolize Resurrection and Rebirth. Of course, the most famous amphibians are those Budweiser frogs. Who can forget the antics of Bud, Weis, and Er in the popular 1990s Super bowl commercials. Tribal tattoo designs from various parts of the world have spiritual significance in their native regions. The most common Tribal Frog Tattoos have distinctly Native American elements that are common in tribes like the Haida. These tattoos symbolize Transformation, Change, and a deep, spiritual connection with the elements of Nature. With the wings of an angel and a flower reminiscent of the Flower Power Revolution in the 1960s, Peace Frog Tattoos combine many elements that are readily identified with Tranquility. By wearing such a design, many persons identify with the message of Peace, Love, and Tolerance. In the Celtic tradition, frogs represented the cleansing and healing nature of Water. Many experts believe that the common fairytale of The Frog Prince actually emerged from the oral tradition of this region. 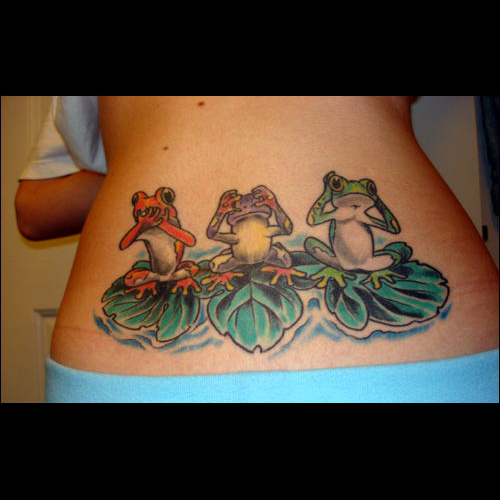 Celtic Frog Tattoos symbolize Restoration and Healing. Choosing the right Frog design for your tattoo is tricky, but when you consider key features like what your new tat will symbolize and where it'll be placed on your body, the task becomes easier. If you need some inspiration, then visit our design page at www.itattoodesigns.com and take advantage of our Custom Service. Our team can design a truly unique piece for you.